above: Arguably Bill Shorten won the recent Leaders' Debate for Labor ; But the leader needs to make clearer the connection between education and infrastructure, and a strong and fair economy. Labor could also do with more policy ambition ; and needs to 'do the right thing' for the elderly, and other vulnerable people. IN the recent Leader’s Debate (29/5/16) for the coming Australian Federal Election it could reasonably be argued that Labor leader Bill Shorten did a pretty good job. Slogans such as ‘Budget Repair that is Fair’ are arguably cutting through ; though Labor needs to come up with more detail as the election day approaches. Shorten’s approach is basically to defend Australia’s minimalist welfare state and social wage – but without such significant new initiatives – say on the scale of the NDIS. (National Disability Insurance Scheme) His strategy is ‘to hold the line’ against Turnbull’s Ideological drive for ‘smaller government’ at the expense of pensioners and other vulnerable Australians. The opposition of the Australian Medical Association to the erosion of Medicare and bulk-billing could be crucial. Shorten is also ‘holding the line’ on Gonski and against the projected deregulation of Higher Education. But Labor’s back-down on restoring Aged Care funding was especially disappointing: and will have bad consequences for some of our most vulnerable Australians. Labor needs to revisit these areas if actually elected. Labor Governments cannot take it for granted they will enjoy the protracted time in office as enjoyed during the Hawke/Keating years. Labor has to ‘seize the day’, and entrench important reforms while it can. Personally I have advocated for the vulnerable elderly and the mentally ill: suggesting the importance of addressing a mental-health related life expectancy crisis. (where about 300,000 people are dying 25 years earlier that the general average) And also I have suggested the necessity of tackling unfair user-pays in Aged Care ; as well as the crisis there with regard quality of life, and in resourcing and staffing the system. But cuts to public investment in education and infrastructure especially are bad for the economy, bad for growth, bad for investment. Businesses will take what they can get. But they also look for an educated workforce and top quality infrastructure. The ‘trade off’ between reduced Company Tax, and reduced spending on infrastructure and education – will leave the Australian economy worse off. Amidst talk on the economy Labor’s Negative Gearing measure is perhaps its most significant new initiative: with the hope it will make housing more affordable, partly as a consequence of encouraging investment in new stock. This would also stimulate growth. Ultimately, there is the choice of whether we pay for infrastructure and Education fairly through progressive tax; or unfairly through 'corporate welfare' (an unfair tax system); or whether we just cop out entirely - 'leaving it to the market' - which will mean privatisation. Turnbull is suggesting an arbitrary ‘locking in’ of smaller government, aiming for around 23.9% of GDP . By locking into the 'even smaller government' option (by some tens of billions) Turnbull will have no choice except to privatise. But privatisation comes with big inefficiencies. The higher cost of private finance ; the costs of marketing; private dividends; corporate salaries and so on. And there is the possibility of private monopolies or oligopolies with unacceptable market power to fleece consumers. Not only will that create unfairness - it will also create inefficiencies that flow on to the whole economy. Shorten needs to be crystal clear that not only is Labor strongest on health and education - But that Labor's commitment to public education and infrastructure is best for the economy as well. This is a great Labor strength if only Shorten is willing to play to it! Turnbull argues he ‘has a plan’. But all this ‘plan’ boils down to in the end is a massive corporate tax cut: premised on discredited ‘trickle down economics’. The expected ‘surge in new investment’ will never come. As opposed to an economic plan, Turnbull’s approach is only to ‘talk about having a plan’. There is no substance. Just a mantra about ‘jobs and growth’, and references to Turnbull’s past business background. Turnbull assumes a highly conditioned electorate will ‘trust’ the Liberals on the economy: and will trust in his business background as opposed to Shorten’s personal background representing workers. Also importantly: Turnbull is attempting to trade on his commitment to build new subs in South Australia. Building the subs will cost $50 billion and create 3,000 jobs. But by comparison the Conservative LNPs withdrawal of only modest support for the auto industry will cost 50,000 jobs. And it was projected about half of those jobs (about 24,000 of them) are lost in South Australia alone. Hopefully workers have long memories; and if not so then Shorten should remind them! This is also an area that Shorten should arguably revisit if he wins the election. Former Prime Minister Kevin Rudd had suggested an initiative which may have saved those 50,000 jobs for only a $2 billion subsidy. Australia could potentially develop an ongoing ship-building capacity: building vessels not only for ourselves, but for the world. But if the auto industry could be restored, arguably there are more jobs in the balance there. Winning back the trust of the auto-manufacturing companies would be difficult, though, after Tony Abbott effectively ‘drove them out of town’. 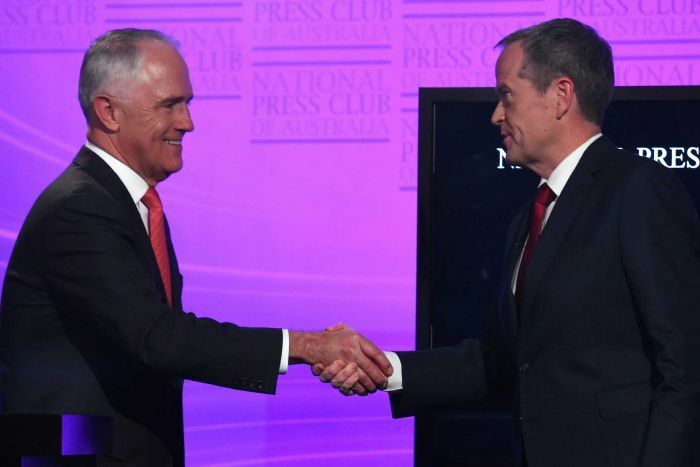 Tellingly, during the debate Turnbull suffered on the theme of climate change. The problem with high expectations is that when they fail to be realised the disappointment is all the more bitter. There is a Centrist, politically and social liberal demographic out there which may have swung the election for Turnbull. But Turnbull’s compromises have given the impression of ‘weak leadership’. Finally: during the debate both leaders were asked to clarify whether or not either one of them would ‘lock in’ with no further changes to superannuation concessions. In an act of irresponsible opportunism, Malcolm Turnbull indicated he would make just such a commitment. But Shorten did not answer the question clearly. Let’s be upfront. According to many commentators superannuation concessions could soon cost close to $50 billion a year. That is: more than the entire Aged Pension budget. This will be partially mitigated by the modest measures taken by both the major parties: reducing concessions for the richest of the rich. But while average income earners should not be targeted, there arguably remains a broader demographic including the indisputably well-off and the upper middle class. Let’s say at least the top 10% income and wealth demographics. In order to reel in this massive imposition on average tax-payers a broader base needs to be targeted. Broad enough to save tens of billions , but narrow enough to be fair. Labor itself has not yet found this balance -aiming for too-narrow-a-demographic to make the difference to the Budget which is needed. For Shorten what is also absolutely necessary is to create a ‘sense of proportion’ around claims in the Conservative tabloid media that Labor are ‘irresponsible big spenders.’ Spending has hovered around 25% of GDP across BOTH Labor and Liberal governments for many years now. In fact both Labor and Liberal have maintained a regime of ‘small government’, and any Australian government would need to double spending by approximately $400 BILLION a year to reach proportionate Swedish levels of expenditure! (ie: at approx. 50% of GDP) As an admirer of the Swedish welfare state, nonetheless that may not be within our grasp! But in fact, if we want to INVEST in education, health, aged care, transport and communications infrastructure, then we do need more progressive tax and higher spending. The alternative is that our services and infrastructure will decay. People will suffer ; and so will the economy. All in all Shorten ‘won the debate’. But this is no guarantee of winning the election. Shorten’s defensive posture - for the most part ‘protecting what we’ve got’ – will appeal to many people. But ultimately we need more if we are to protect the vulnerable, and promote the rights and interests of the working class, and of low to middle income earners. Here’s hoping for more ambition from Labor as the campaign continues.